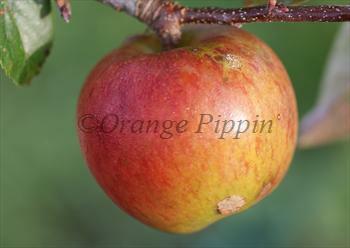 Bright Future is an attractive modern eating apple, with a good pedigree and an excellent flavour. If you are looking for a high-quality dessert apple, this is a good one to consider. The flesh is quite hard and dense, with rich aromatic qualities, and an attractive fruity note. It is a late-season variety and will easily keep in a domestic fridge into the new year. Bright Future was one of the last apples developed by the modern English apple breeder Hugh Ermen, and has arguably the most sophisticated flavour of all his varieties. Also developed by Hugh Ermen. Another variety notable for excellent flavour. Crisp flesh and a good balanced flavour. Has a similar hard flesh and good sweet/sharp flavour. Bright Future is in flowering group 3. Bright Future is self-sterile and needs to be pollinated by another tree of a different variety nearby. Since it flowers in the middle of the blossom season it can be pollinated by most other apple trees. Bright Future inherits many of the easy-growing qualities of Discovery, which is one of the more reliable and disease-free English apples. However unlike Discovery this is a true late-ripening variety, and to achieve the excellent flavour that this variety is capable of it needs to be planted in a sheltered location in full sun. Bright Future was developed by English apple breeder Hugh Ermen and released in 2008. It is an interesting cross between a very late-season Australian apple variety called Lady Williams, and the well-known early-season English variety, Discovery. Although it has the easy-growing nature of Discovery, in every other respect it takes after Lady Williams - which is also one of the parents of the popular supermarket variety Cripps Pink. Bright Future features the same hard dense flesh and a similar fruity flavour.